Arrangements have now been completed and visitors tickets are now available from Dartmoor Lodge Hotel , Ashburton. The Sea Trout Inn, at Staverton, where our visitors tickets have been sold for some years, is closed presently. The position as of 15th April 2019 is that tickets should be on sale within the next few days at Dartmoor Lodge Hotel , Ashburton. We will post confirmation of this as soon as things are up and running, which should be before Easter. Most members will have received this season’s membership cards by now. Due to an administrative error at our busy nerve centre, a small number of the new cards have been issued with last years date. If you have received one of these you may contact the Hon Sec to obtain a re-issued card. Alternatively, the data protection statement you should also have received can be used this season in combination with your 2018 dated card as proof of membership. Here’s wishing all our members a pleasant and successful 2019 season. The Wild Trout Trust annual online auction is still live until Sunday (16th March), when items will close throughout the evening. There are many fabulous lots, catering for pretty much every purse and every taste in trout fishing, other fishing opportunities, tackle, tuition, art, literature and shooting. The money raised will be spent to benefit our rivers and their trout and sea trout. If you have not yet had a look at the auction there is still time. Details of the lots on offer are available on the Wild Trout Trust’s website, with a link to the auction hosted by eBay or go straight to the auction listing here. Just a reminder that Graeme Harris is coming to speak to us tomorrow evening. Graeme has been consulted by the Association regarding possible improvements to be made to TWP to bring it back to its former glory by managing flows etc. Obviously, members views on this would be useful so please come if you can. As he is a renowned authority on sea trout, no evening with Graeme would be complete without a few words about them and this will be the subject of the second half of his talk. There will also be a free buffet. The meeting is at 1930 tomorrow – Friday 8th March – at the Dartmoor lodge Hotel, Ashburton, TQ13 7JW. Robin is keen to work on Quarry Pool, Whortley etc and suggests meeting (and parking) at Stretchford for 9.30 a.m. The forecast is pretty ok with the possibility of a shower or two but nothing else too alarming. 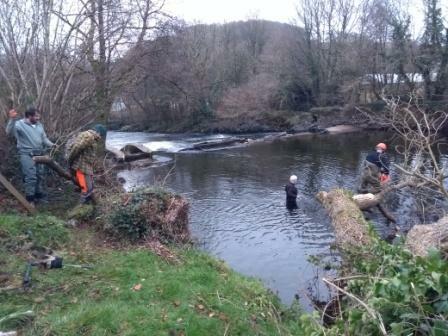 Bank clearing is underway, with Robin leading the team. There is much work to be done, so we need plenty of volunteers. We meet on each Sunday morning for the first few weeks of the year and the work can be more or less physical, depending on the individual. In any case it is a good way of working off some of that Christmas pudding, good fun and, particularly for newer members, a good way of getting to know the river and an perhaps an opportunity to discuss tactics with other members. The photo below was taken last week when the team removed a tree from Kilbury. Anyone with a couple of hours to spare on any Sunday morning in the near future would be particularly welcome as attendance has been a little low this year. You will find the list of dates and venues here. This work has to be done for the benefit of all so please come if you can. Members, if you have some time to spare on the following dates your presence at one or more of these sessions would be very much appreciated to help with river bank maintenance. For newer members this is a good opportunity to get to know your fellow members and the river better. 3rd Mar- Fogdens- (tree removal subject to water height) head of Abbots Mead. 93 total for DAA waters. Wishing all our members and friends a very merry Christmas and a fishy New Year. Low water and steaming temperatures kept fishing to a minimum throughout the summer with very few salmon seen or caught: those reported included fish for Bush and Rob Dart junior. A couple of spates brought a few more anglers out with early autumn success for Andy Myall and Robin Thorne – clean grilse of 4/5lbs – and another of 6lbs for Rob Dart senior. One or two other fish have been caught further up the river but unless things change fairly radically September seems unlikely to bring significant change. Sea trout fishing was dire in the hot weather with many rods simply not bothering. Bits and pieces of rain in late July and August have at least provided some sport with school peal.